Sensodzi (金龍山浅草寺) – or Asakusa Kannon Temple – one of the main Buddhist temple in Tokyo, featuring a special splendor and beauty.Not to be confused with the Asakusa Shinto shrine located nearby. The temple dedicated to the bodhisattva Kannon – the goddess of mercy.According to legend, in 628, the two fishermen found in the river Sumida statue of the goddess, and the head of the village, to which the fishermen come for advice, saw in this holy sign. The mayor gave his home for his subsequent conversion to Kannon Temple, and 645, the construction of the temple Senodzi, now the oldest in Tokyo, has been completed. Before World War II, the temple belonged to the Tendai Buddhist school, professing a certain direction of Buddhism, but as a result of the bombing of the building was destroyed. Later, the building was rebuilt, and the temple became independent from schools. 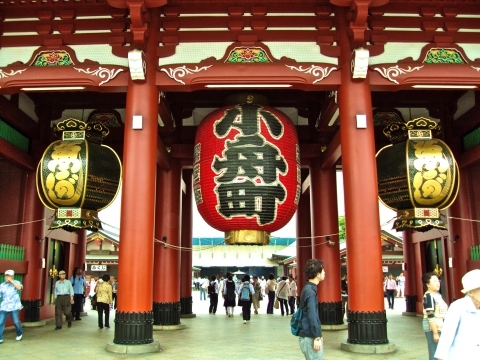 Before we get to the temple itself, visitors pass through the outer gate Kaminarimon or “Thunder Gate”, decorated with a large Japanese lantern – is the main symbol of Asakusa. On the territory of the temple there is an ancient shopping street Nakamise, which leads to the second main gate of the temple – Hozomon. Outside the gates Hozomon is the main hall of the temple, dedicated to Kannon – here everyone can make a prayer to the goddess. By tradition, at the entrance to a temple made to wash his hands in the holy water fountain of the dragon. 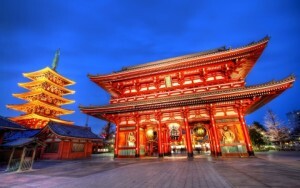 The ritual appeal to the Goddess also has its own quirks, for example, before you say a prayer, twice clap his hands – it is believed that in this way the applicant draws attention Kannon. Upon completion of treatment, toss a coin for good luck in a special wooden box. On the territory of the temple held many important events, one of which – Sanjeev Matsuri, a three-day festival, which takes place in May, in honor of the founders of Sensodzi temple. Sanjeev Matsuri – Shinto festival officially takes place Asakusa temple, mentioned earlier. But do not be confused by the religious confusion: In Japan, Buddhism and Shintoism are closely intertwined and are a single whole. 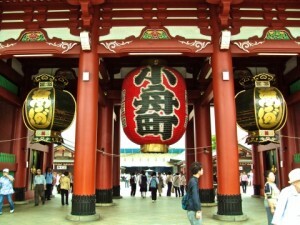 However, even if you can not visit the Sanjay Matsuri, you can see in the Asakusa Kannon Temple lot of interesting things. Before entering the main hall you can get fortune telling, and there are many around Sensodzi traditional Japanese shops and stores, and small restaurants that serve sushi, noodles and tempura. 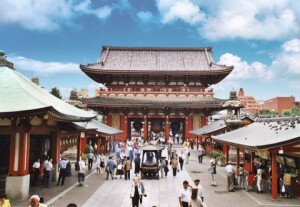 Many shops and stores are on Nakamise Street, adjacent to the temple.